TT Gateways Version 7.15 and higher do not include TT Server Admin. However, TT offers TT User Setup as an advanced tool that provides similar functionality to TT Server Admin and includes superior user management. For more information on TT User Setup, refer to the TT User Setup System Administration Manual. Upgrading an existing Gateway to Version 7.15 automatically removes TT Server Admin from the server machine. (S)how current users: Identifies all active connections on the TT network. (G)et workstation logs: Collects, zips, and retrieves remote log files. (B)roadcast Message: Sends a message to all X_TRADER®'s logged into the specified TT Gateway. This message displays in a pop-up prompt box. (R)eset Exchange Tree: Resets the exchange tree for all Guardians version 7.5.3 and higher within the same multicast. This feature available in TT Server Admin versions 7.5.1 and higher. 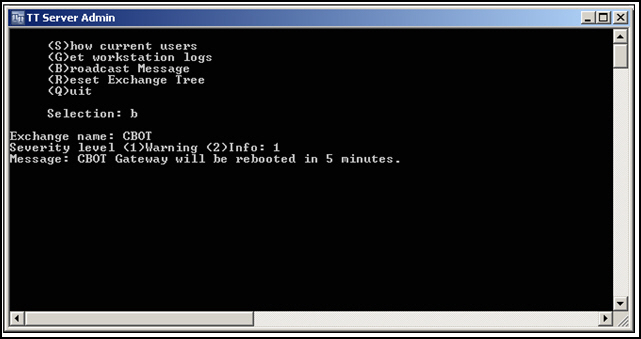 (Q)uit: Closes the TT Server Admin command window. 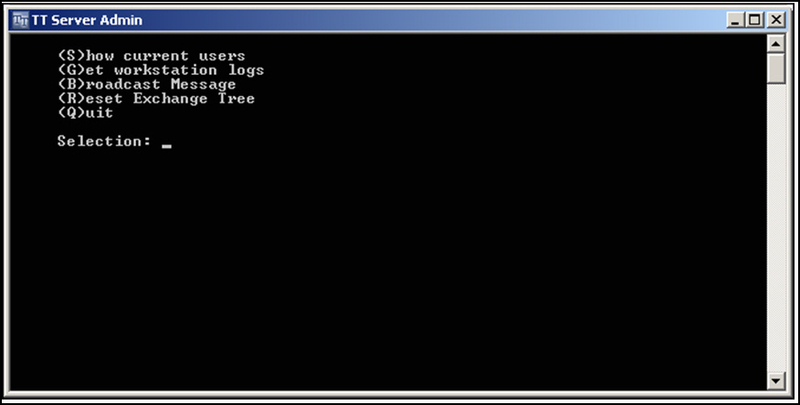 On the Desktop, double-click TT Server Admin. You are prompted for a Workstation IP-Address. Where IPAddress is the IP address of the workstation or TT Gateway that stores the log files you want to collect. This IP address can be that of any machine that runs TT’s Guardian software. Though the machine must be online, it does not have to be logged into the TT Trading System (i.e., the machine does not have to appear in the active connections list generated via the (s) command). Note: Do not enter the IP Address of the local machine. Doing so can corrupt the resulting zip file. If you need to collect the local machine's log files, use Guardian's Collect Local Logfiles option on the Tools menu. After you press ENTER, the program collects, zips, and then transfers the remote log files to <root drive>:ttlogfiles. The naming convention used for the zipped collection of log files is IPADDRESS_DD.MM.YYYY_clt.zip, where IPADDRESS is the IP address of the gateway, DD is the two-digit day, MM is the two-digit month, and YYYY is the four-digit year. You are prompted for an Exchange name. Exchangename is the name of the TT Gateway that hosts the connections to which you want to broadcast your message. You are prompted for a Severity level. Type the appropriate severity level. 1 for a Warning (e.g., an imminent TT Gateway shut down). 2 for an informational message (e.g., a reminder). You are prompted for the Message you want to send. In the above example, the user sends to all traders logged into the TT Gateway named CBOT a warning with the following message: CBOT Gateway will be rebooted in 5 minutes.When a client application receives the broadcast, it generates a pop-up prompt box that displays the message. The exchange tree resets on all Guardians version 7.5.3 and higher in your trading environment.